Love the finish! It is so cute! 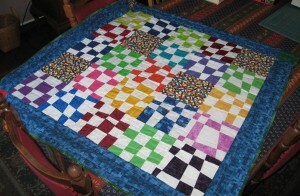 I want to make my own quilt with these blocks some day. Oh, I still love these blocks! Your quilt looks great. I still have this pattern on my to-do-one-of-these-days list! Good luck with the next one. I like the plain squares of crayon fabric mixed in with these blocks. Nice job! FYI, I edited your post to move it into the Show & Tell category so it will show up in the Gallery and in the slider on the Home page.